Today we managed to put the cover on the polytunnel with the help of James and David. First I built a bit of supporting framework on the inside out of 100mm x 100mm fence posts, we have three posts going vertically and then two going horizontally with a lap joint in the middle. 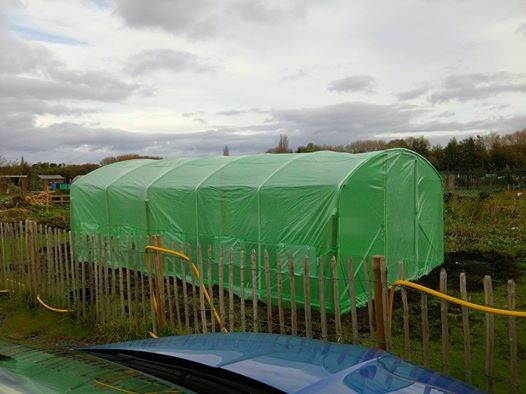 The timber will help give the polytunnel more stability in the wind and also will give us something to attach netting to and maybe some hanging baskets. Next step will be to build some raised beds inside, but that will likely be done in the new year as there isn’t much point doing it now with winter rolling in.